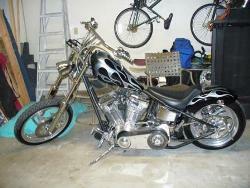 Description Custom chopper stolen during a home burglary in Corona, CA. Bike info: License No. 16R7863, Atlas rigid frame VIN No.1A9HS74A8WA329190, 96" S&S EVOII motor No. DLK311546, 3" BDL open primary, Jesse James fenders, hell bent pipes, and villian gas tank. Any info, please call.